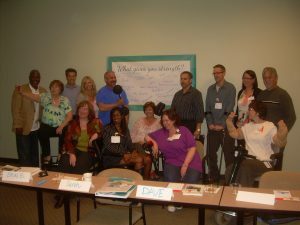 Pharma Companies Invite MS Bloggers: Let’s Talk! Talk is good. Attentive listening enables trust and knowledge. Interactive discussions generate ideas and resolves problems. All of these can be a catalyst for action. On April 14, I was invited to attend a MS Blogger Summit, sponsored by two pharma companies—END Serono and Pfizer. Their objective? They wanted to reach out to us about our lives with MS and our blogging, and how they could continue to support the MS community. The summit was professionally arranged and conducted–from the accommodations, to the moderators/speakers, to the agenda. Interaction and information exchange among all participants was sought; it was achieved. The companies wanted to listen and learn from the ten of us MS blogger attendees. They also included the caregivers that attended with some us of bloggers because after all, they are living with MS, too. The MSers were a diverse group. We came from nine different states, had varying degrees of disability and how long we lived with MS. The sponsors were just as diverse. They represented a variety of positions from communications, MS Support, and social media personnel to the top CEOs from both pharma companies. Were they sincere? I believe so. They listened intently and questioned us a lot about what personally makes us strong in managing our MS, what inspires us to blog/advocate, what motivates us… They gave us a tour of their MS call support center with a follow-up Q & A session with the staff. The use of social media was discussed much—the types, role and content of the numerous platforms that are currently available. I was honored to be invited and was gratified that finally MS patients were called upon (for a change) for OUR input. We are not celebrities, doctors, or non-profit MS associations. We are ordinary people living with MS. And we MS bloggers have been out there seriously interacting with others in the MS community. The MS bloggers established an instant camaraderie; we are peers. Many of us have crossed paths in the social media world, but it was beyond words to describe what it felt like to meet in person. To touch, to hug, to look each other in the eye and read each other’s body language. When the questions were asked about what makes us strong, inspired, and motivated to reach out to others while managing our own MS, the included: life, family, faith, hope, helping others, laughter… Each of us bloggers shared our personal stories. But I have a theory and believe there is another major thing that we didn’t really touch upon. Most of the thousands of MSers I have interacted with over the past 34 years I’ve lived with MS have a unique thread about their personalities. I find that MSers are achievers, go-getters, ambitious, and doers. We have in inner desire to push ourselves, to be ambitious, to strive for perfection. These traits impose incredible stress on us; and anyone with MS will tell you about the negative impact stress has on our physical, mental and emotional states. Any type of stress causes MS symptoms to react; chronic stress can leave one incapacitated. Could this type of chronic stress inherent to our personalities be a trigger to “bring out” our MS? At the same time, could this stress created by our personality traits produce the adrenaline that enables us to go on and move forward, in addition to the other things mentioned like life, family and faith? The one evening/one day summit flew by and an additional day would have been better. It was important and great fun, but the intensity of the agenda and travel for most of us left us quite fatigued and overwhelmed. Nevertheless, we would all do it over again, and left well-connected and grateful when the summit concluded. The following are some of my personal thoughts/concerns that I contributed to the event that led to some discussions and sometimes agreement. We bloggers were asked not to share the pharma companies’ propriety information, but were invited to share our insights publicly. • The subject matter was based primarily for social media platforms. Why not step outside that platform and do more networking with other forms of media, such as TV or magazine that would include quality info? I’m not talking about a personal interview with a newly-diagnosed famous person “battling” MS, nor a 5-minute interchange between say, a neurologist and a journalist announcing a new treatment. • Much more work needs to be done in educating people about MS, not just making them aware of it. There are too many misconceptions about MS and it is too often forgotten because so many symptoms are invisible. Sadly, the MS events (e.g. MS Walks) rely on friends/family and reach no further than that. Most bloggers agreed that both awareness and education is sorely lacking outside of the MS community. I shared a story about a hospital stay I had last year because of some serious MS complications. Most of the staff did not really understand MS nor its medical implications. This is a tragedy; it is a highly-rated hospital in Phoenix. I later invited myself to do a one-hour education program about MS to that hospital staff and they loved it. • The numbers of persons with MS need updated. The same number of persons with MS has been used for at least the last eight years by everyone—MS Associations, pharma companies, doctors, etc. This is ridiculous. In addition, the number of people dealing with MS is staggering when you take into account family, friends, health professionals, etc. over a lifetime!! The financial impact of supporting MSers’ drugs, equipment, and health care is also staggering and affects most of our population. Saying MS affects 400,000 in the US gets us nowhere. Larger numbers speak volumes. There is strength in numbers—especially accurate ones. • There needs to be more collaboration with all the players in the MS Community—the MS Associations, the pharma companies, the social media platforms, the medical field, etc. Everything seems disjointed. There is so much stuff out there and often information is inconsistent or incorrect. The disease itself is complicated and creates so much fear; this fragmentation or lack of unity adds to the complexity and fear. Where should a MSer start or go for the best help/info? Who/what should he/she trust? Somehow, someway, these players need to come together. Maybe once a year—during March, the MS Month—on a main stage on a national level? An MS 2-hour TV education special? Again, there is strength in numbers, and education. But the point was raised, how do we do this? A main coordinator or a committee would need to be established. • I look at social media as either being a best friend or worst enemy. There is a time and a place for it, and selection is critical. Part of my feelings is due to my age, part is due to the fact that I have only been involved with social media for a little over two years, and part of it is that I have had years of experience speaking with people about MS as a trained MS Peer Counselor in countless situations and circumstances. I have dedicated three decades of my life helping people dealing with MS as I myself lived with it. My personal motto is: knowledge and support = less fear. Sometimes social media platforms are biased, overwhelming in content and downright incorrect that causes more fear and stress. An upside to it? Information is at your fingertips; it is an alternative to the frustrations of the phone world, where people/offices don’t answer, re-route you, don’t return calls, drop your calls, or answer your questions by reading from a manual/script. • Much emphasis by most in the room is that we should use social media to inspire others and offer humor, as positivity is essential for a person dealing with a chronic condition. I am certainly a proponent of this and do it myself in the MS community. However, I suggested there needs to be some different support available besides inspiration and humor. I’m talking about the times when a person just needs to vent, be listened to, receive empathy (not sympathy). Let’s face it, sometimes things just aren’t funny or it isn’t the right time for inspiration. And info should be realistic as much as possible. Maybe I feel this way because I was probably the MS Blogger in the room that lived with MS the longest. I have a club of “Old MS Vets” who have lived with MS for over thirty years. There is a difference in perspectives and extent/types of knowledge between those who have lived with it over longer spans of time, as well as those who have different levels of disability. I must emphasize that the MS Bloggers at this event are valuable resources that offer a wide spectrum of support and things to offer through: inspiration, humor, research updates, event info, MS news, tips to help manage MS, etc. etc. etc. through many reliable sources. Four of us have written books, and all of us write, share and care. I find them trustworthy after meeting with them. Names and websites are below. A recent Facebook site, Multiple Sclerosis Bloggers and Writers was set- up, and is open to any one to check out and be included https://www.facebook.com/groups/1426077517643614/. Overall it was a win-win situation and I hope other companies and organizations helping the MS community will follow their lead. There is so much more that could be done.